All These Shapes Can Be Made with Geom-e-Tree! You don't have to be a Rocket Scientist to make or enjoy these patterns! It's an immersive experience to see how the tree morphs from one pose to another. You can enjoy it again and again as you gain an intuitive appreciation of these natural patterns. We have not developed a naming system (taxonomy) for all these patterns, so their names may change in the future. Suggestions welcome! There are many more patterns. See our Poster that arranges 150 related Geom-e-Trees. The right column tells how to make the shapes and patterns. If you don't have a good eye for angle measurement, you may have to consult the Share/Save tab frequently to see how you are doing. Notation [N,θ,CR] defines the tree, where N is the number of branches at each node, θ is the angle between branches, and CR is the Common Ratio of one branch to the next. 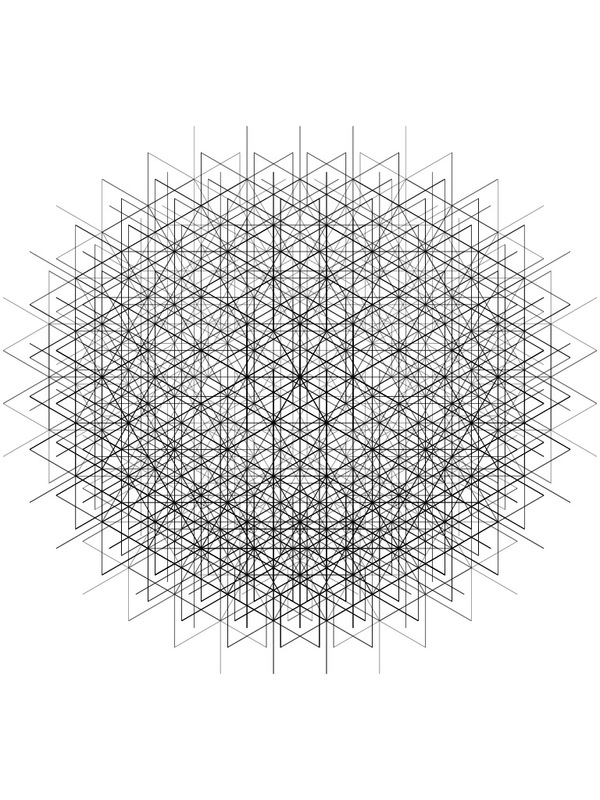 When the branches are not all lined up and overlaid like the grids on this page, you often get a kaleidoscopic pattern. The iPad-sized of this one is exquisite! The smaller devices produce the iPad-sized image (with the finer details) for Photos or Mail. 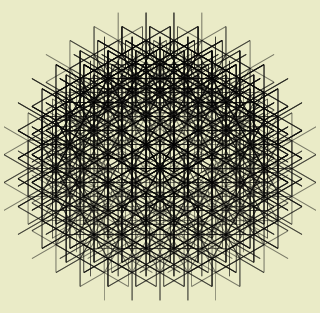 You can click on this pattern to display a larger image, (768x1024, 300K). You may need to click on the resulting image if your browser window is set small and your cursor turns into a magnifying glass. 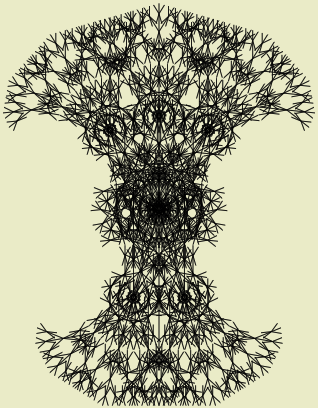 To make this pattern, vivify the 4-branched tree from the Arboretum. Reduce the angle to where the three angles are 60° — the two outer branches will be straight across. Then pinch the common ratio down to 1.0. Good Luck... it's difficult! Start with a five-branched tree. Double tap to turn on the perfect reduction factor for a while. Open the angle up, way up.. past the pentagon at 144° to where three of the branches point up, the other two branches down. 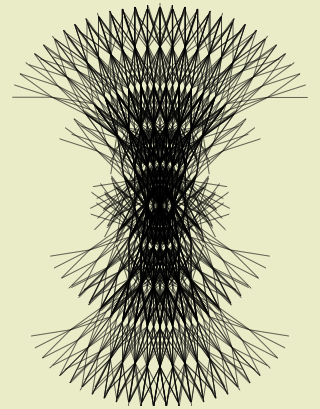 Then pinch the tree into itself to get the even more crazy overlapping pattern. I call it R.Crumb because it reminds me of the many cross-hatched lines in the artist's work..
You can see out on the ends of the branches that there are tiny trees all with two branches down and three branches up. This is just the R.Crumb Tree pinched down a little more, with the angle adjusted. There are many of these tribal shield-like patterns. [5, 165°, 1.72] depending on your own taste.